Amazing…this one. The glaze as it cooks plus the gravy you make after it cooks…simply scrumptious! A flavor explosion! 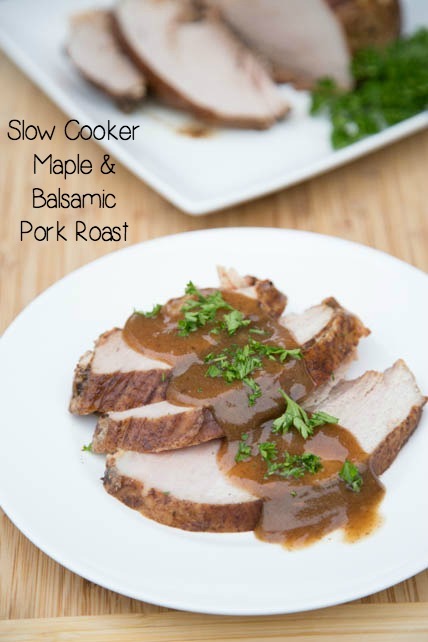 This recipe does require you to cook the sauce/glaze for a few minutes before pouring it over the pork roast in the slow cooker, or in the freezer pack. Toss in some baby carrots and potatoes/sweet potatoes to make this a one dish slow cooker dinner! Gluten Free modifications: Use GF flour when making the gravy. Serve with mashed potatoes or mashed sweet potatoes instead of dinner rolls. Whole 30 or Paleo modifications: Serve with mashed sweet potatoes, in place of the dinner roll. Omit maple syrup if Whole 30 and just pour the balsamic with some olive oil over the roast. 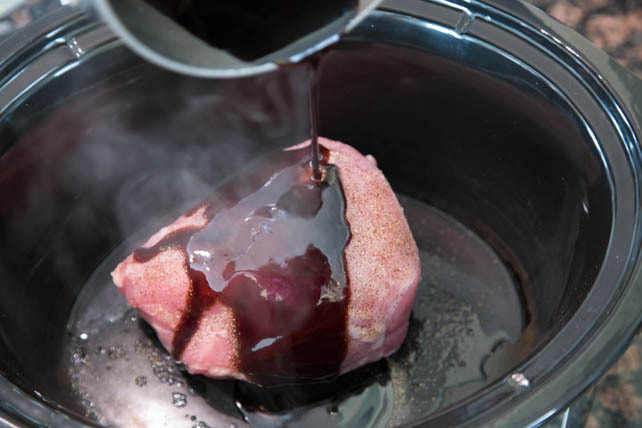 In a small saucepan, whisk together the balsamic vinegar, maple syrup, cornstarch, onion powder and garlic powder. Let simmer over medium low heat for about 8-10 minutes, or until sauce thickens. Add the pork roast to the slow cooker and season with salt and pepper. Then pour the glaze over the top, coating the roast with the glaze. Gravy: Strain about 1 cup of the juices in the base of the slow cooker and heat over low heat in a small saucepan. Whisk in a teaspoon or two of flour and let thicken. 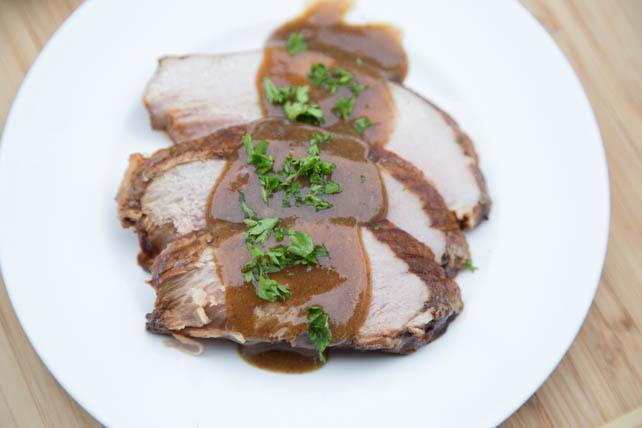 Serve over the sliced pork roast. To pack into gallon size freezer baggie: Label. Then, follow the same directions in the first 2 bullets. Let the glaze cool for about 10 minutes, before pouring into the bag. Remove as much air as you can and seal. Place in the fridge to let the glaze cool completely before adding to the freezer. (This will help prevent freezer burn.) Freeze up to 6 months in your fridge freezer or 12 months in a deep freezer. This recipe is featured on SouthernPlate.com’s Meal Plan Monday #54.